Till 2012, Sujatha was leading a normal life with her husband and two young daughters. In 2012, Sujatha had typhoid and admitted in a private hospital in Kodigehalli, Bangalore. 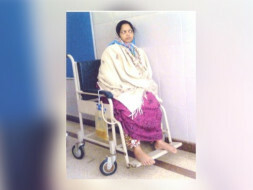 After discharge from the hospital she was not able to pass the urine and her lower abdomen was swollen. 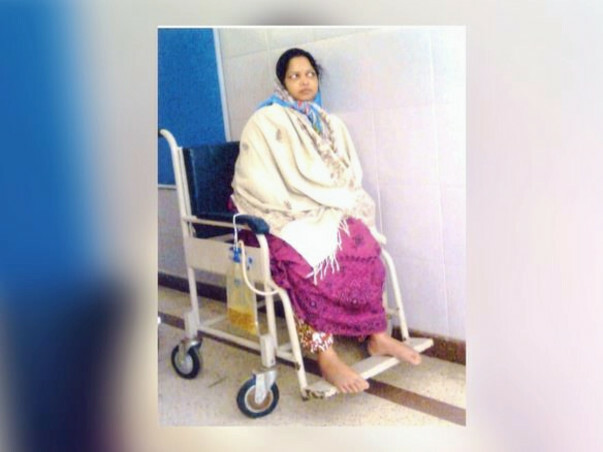 Her Husband rushed her to the nearby clinic and she was referred to the nursing home at Sanjaynagar. 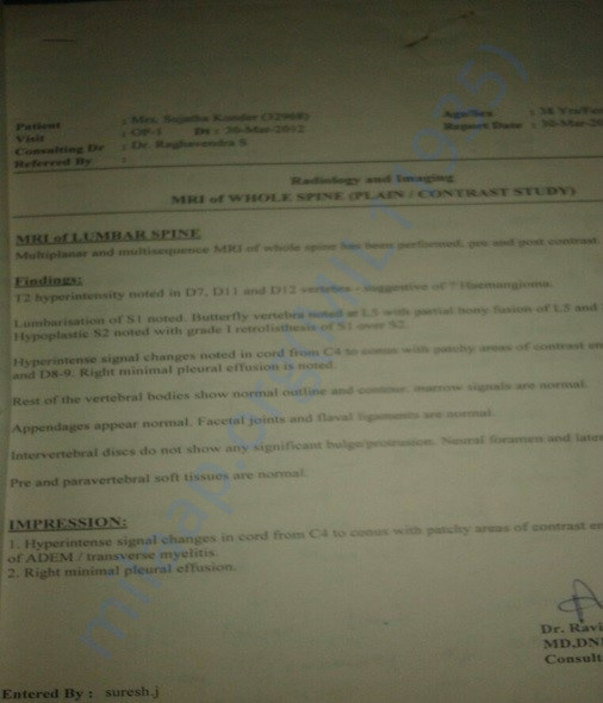 Doctor informed that she is losing sense in her left leg, hence for the immediate treatment referred her to Vikram hospital. Because of the financial constraints, husband taken her to Nimhan’s Hospital. She was diagnosed with Transverse Myelitis and lost sense in both the legs. 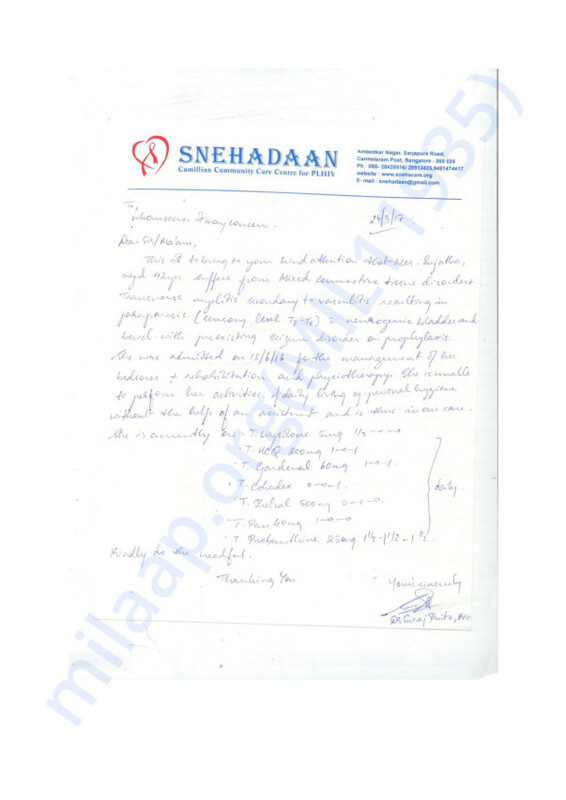 Doctor informed that recovery is slow with this medical condition and she received 3 months of care in Nimhans. Sujatha continued to be dependent on family members for her routine work at home. She was completely bedridden and had to be attended for every single task. Her husband lost his salaried job due to repeated leaves. During this difficult situation her elder sister who is widow extended support to the family by looking after Sujatha and her daughter’s education. Recently due to severe back pain elder sister could not extend her support to Sujatha’s family. At this juncture Sujatha’s husband found difficult to manage his wife and two young daughters who are 8 years and 11 years. Hence the option left out with them was to shift Sujatha to the rehabilitation center such that she would receive round the clock care. He admitted her in Snehadan, Bangalore. The expense of her treatment is coming up to Rs. 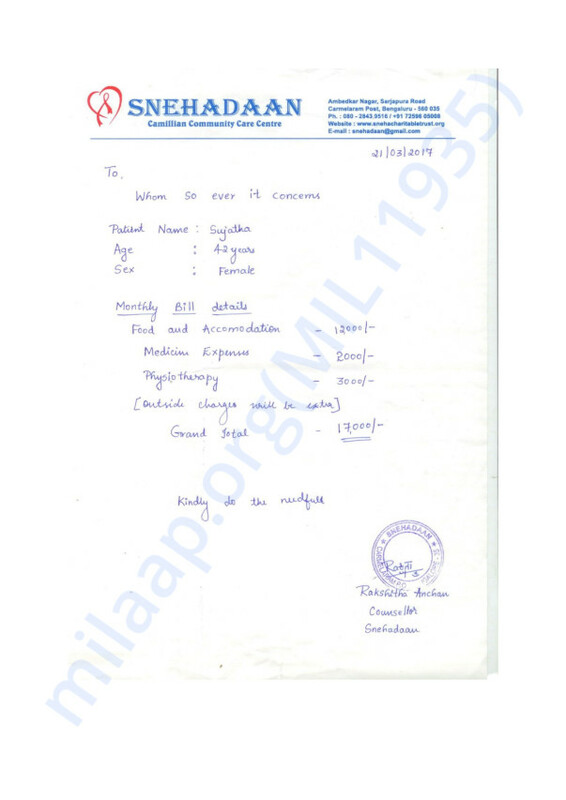 20,000/- per month [care center charges 15,000/- and treatment and Doctor charges around Rs.5000/-]. Her family is struggling to bear these expenses. Your contribution will enable us to provide quality care for Sujatha and see the smile on the faces of her husband and two young daughters. Sujatha has to come back home as the rehabilitation centre where she was getting care is under renovation. Family could not find any other suitable place for her care. Her husband is currently alone managing at home to take care of her and children and also earning for the family. Finding a care taker is difficult for the family due to financial constraints. Look forward for to your support for getting a care taker or financial assistance. I spoke to Sujatha's friend Saroja. The money raised so far has been utilized to pay her treatment expenses at rehabilitation center. Sujatha was happy to know that some money has raised for her treatment. Sujatha is able to withstand her current situation because of the constant and timely psychological support given by her counsellors. She is been undergoing physiotherapy at center. She is been encouraged to take part in making ''beads chain'. And she gives competition with other inmates in the rehabilitation center! Let the positive thinking in her become stronger and wish her speedy recovery.. I am Debotri, a fellow at Milaap. 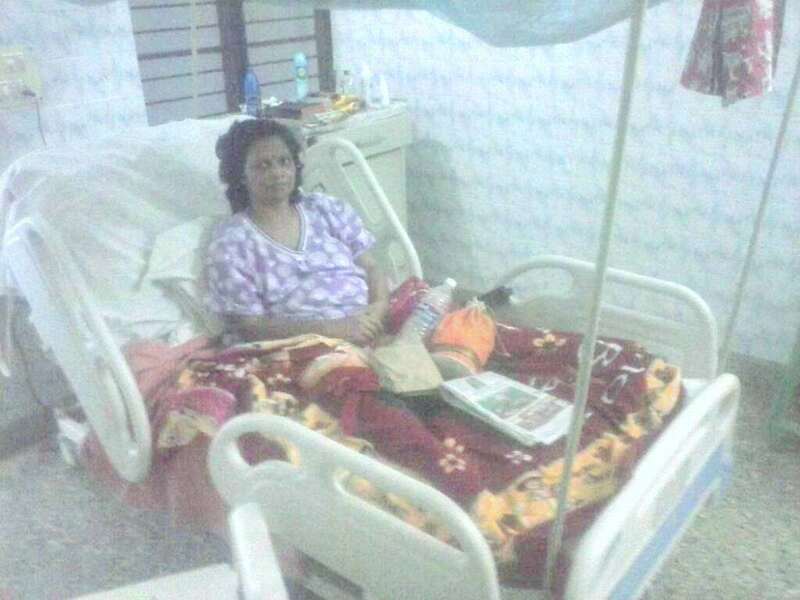 Here is an update on Sujatha's treatment. I spoke to Sujatha's friend, Saroja this morning. "Currently she is at a rehabilitation centre, Snehadaan in Bangalore for the last one year. She is undergoing physiotherapy twice a day. Apart from this, she gets support from the nurses who helps Sujatha to perform her daily activities. She has proper senses above the abdomen, however, things are little critical below it. Neither she can move her legs nor she can turn around without the help of a personal assistant", said Saroja. Sujatha was a working lady who knew perfectly well to balance her personal and professional life. But nobody ever thought that someone who was so active previously would now bedridden. She cannot be taken back home since she would need a personal caretaker throughout the day. Her husband, Vijay, is presently working in a construction firm, pays a weekly visit to her. However, Sujatha's children can come only once a month to meet their mother. Things although have got little better. She does small craft work and it makes her immensely happy. Apart from this, she has also gained weight. However, since she does not have the sense to pass out the urine, she is mandated with catherine pipe. "I would like to thank the donors for supporting us in whatever way possible. Your support and contribution will never be forgotten. However, since we have not reached the target amount yet, please share her story. 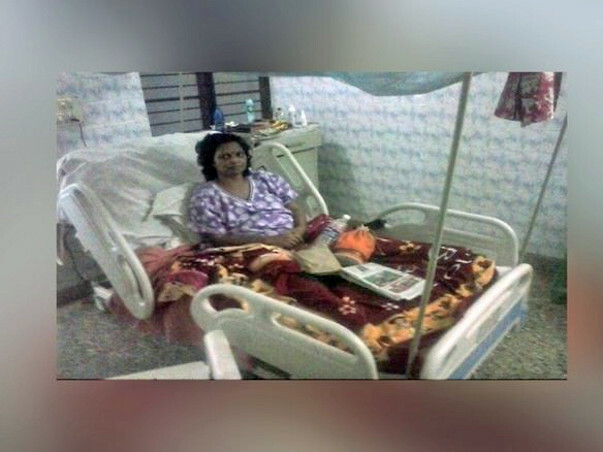 The family is finding it extremely difficult to meet Sujatha's medical expenses", Saroja said. Preying for Sujatha to stand on her legs soon. Believe in yourself to overcome this health condition. God is with you.